The first thing that stands out in the image is that this is a long term camp or the term being long enough to afford some common comfort as these chairs and folding table. A constant argument in reenacting today is what level of camp presence do you portray when at a battle event. This image is proof that this level of equipage was used in camps, but what was common for a campaign? There are two camps (pardon the pun), one that wishes to portray as much of the comfort (for themselves) by using implements such as this table and chairs, tents, cooking and eating utensils etc. The common reply is “if they used them, why can’t I”. The problem is that they would not travel well requiring a large baggage train. The other camp are those who wish to portray a campaigner impression. My own reenacting battalion, The Army of the Pacific – a western reenactor group, does a campaign impression whenever possible. A motto is use only what you can carry on your back as being representative of what the common infantryman was allowed to carry with him. NCOs and officers were allowed more baggage, but an infantryman was only allowed what he could stuff into his knapsack. Tents such as what are in the background were cumbersome and necessitated a long and vulnerable baggage train to transport, meaning more animals to feed and more wagons to haul stuff around in. I find it interesting that the photographer chose to arrange the men in rank order, the Corporals being in the middle flanked by the two Sergeants. Also note the booze on the table, at least what I’m guessing is probably alcohol. This was not uncommon to purchase from sutlers or from civilian sources. 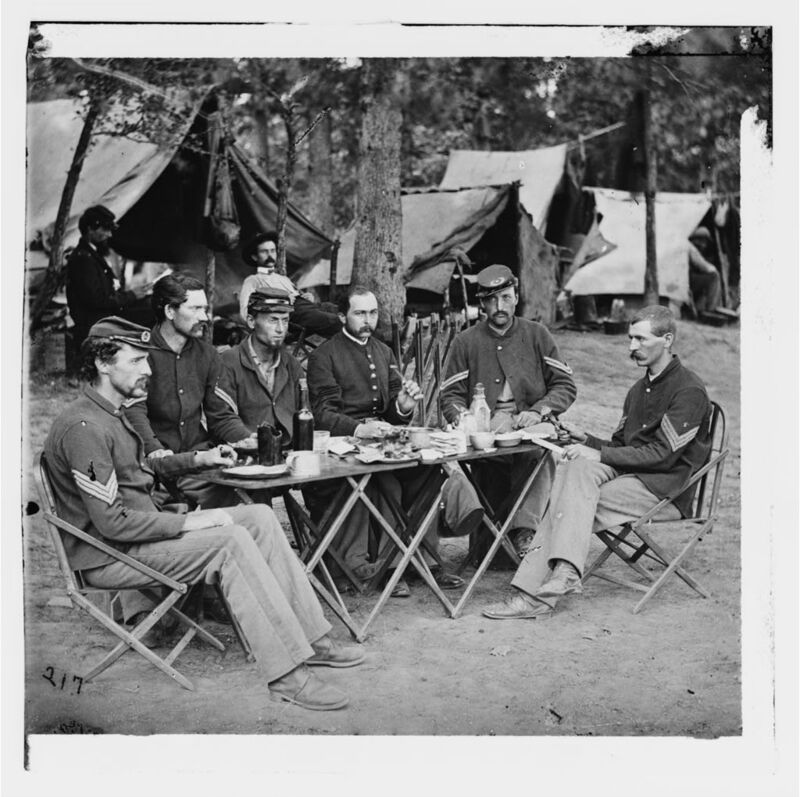 The army did allot a whiskey ration to their quartermasters, the higher the rank the more you were allotted and there are stories of soldiers breaking into Sutlers tents or pilfering the Officer’s allotment of whiskey at times, but for the enlisted men this would amount to barely a mouthful per man per day. This would have been a regulated allotment and kept under tight control. From the uniforms, the federal Sack Coat or fatigue blouse is what is in evidence. This was a four button coat that is obsequious with the view of the common federal soldier. This fatigue blouse was what the soldier wore for all normal duties as opposed to dress format for parade and other official functions. Volunteer units when raised were issued state level equipments and uniforms and once federalized would then often be issued federal kit that would have included the Sack Coats. But, this was not a universal issue as Ohio and New York in particular issued state militia jackets, a shorter waist and many more buttons on the front. Another feature of this image is the forage cap dangling from one of the support legs of the foldable table. For the federal armies, this was the most common head ware used. Deriving its name from the deep, pocket like top of the hat that falls down unto the brim, the hat was used for gathering forage when sent out on such patrols where the goal was to by hook or by crook gather in as much food stuffs as the men could carry. Forage caps were common issue as opposed to the head gear being worn by the sergeant to the far left of the image. He is wearing a Kepi, a shorter crown cap that is probably more synonymous with civil war headgear but less often worn by the enlisted men and NCOs. Kepis were most often worn by private purchase. Officers in the Federal army were given a clothing allowance as part of their pay and not issued uniforms, having the freedom to make their own. The most famous example of this is George Armstrong Custer whose uniforms were hyper customized. To this day it is the prerogative of Generals in the army to customize their own uniform wear. It is probable that this sergeant has privately purchased this Kepi for his own use. A close look at the Corporal second to the right shows the common look of a forage cap. Another view of some of the variety evinced in this image is the wide NCO stripe down the trouser legs of the sergeant to the left of the table. NCOs were allowed to wear a distinction to their trousers denoting rank, a thinner stripe for corporals. The sergeant to the far right has not affixed any to his trousers. The difference here can be clearly seen by the man standing second from the left. He is wearing the Federal Frock, high standing collar and infantry piping on the cuffs. There are other NY Frocks evident in this image as well sporting a traditional collar. The black chevrons on the above image on the man in question are of militia vintage for NY pre-war units. At the date that this these images were taken, the preponderance of militia uniforms is interesting as three years of campaigning had either not worn them out or that the state of New York was still suppling her regiments with materials. If there are other items of interest I’ve missed or tidbits I’ve gotten wrong, please pitch in and let’s mine these images for what they tell us. I try to blog something once to twice a week. Thanks a lot for being the instructor on this subject. My partner and i enjoyed your current article very much and most of all appreciated the way in which you handled the aspect I regarded as controversial. You’re always quite kind to readers much like me and aid me in my life. Thank you.